Wondering if you have a rare and valuable 1999 Georgia quarter error? Millions of people like the 50 State Quarters. But what many diehard coin collectors love is finding rare error quarters that were mis-struck, contain odd die varieties, or have other unusual markings! The 1999 Georgia state quarter is commonly sought by those who are trying to find rare and valuable error coins. So, what 1999 Georgia state quarter errors are known to exist? There is presently one major Georgia quarter error involving some pieces struck on experimental metal intended for the Sacagawea dollar. I’ll talk more about that in a minute. As for significant doubled dies and the like, there are no known major errors. 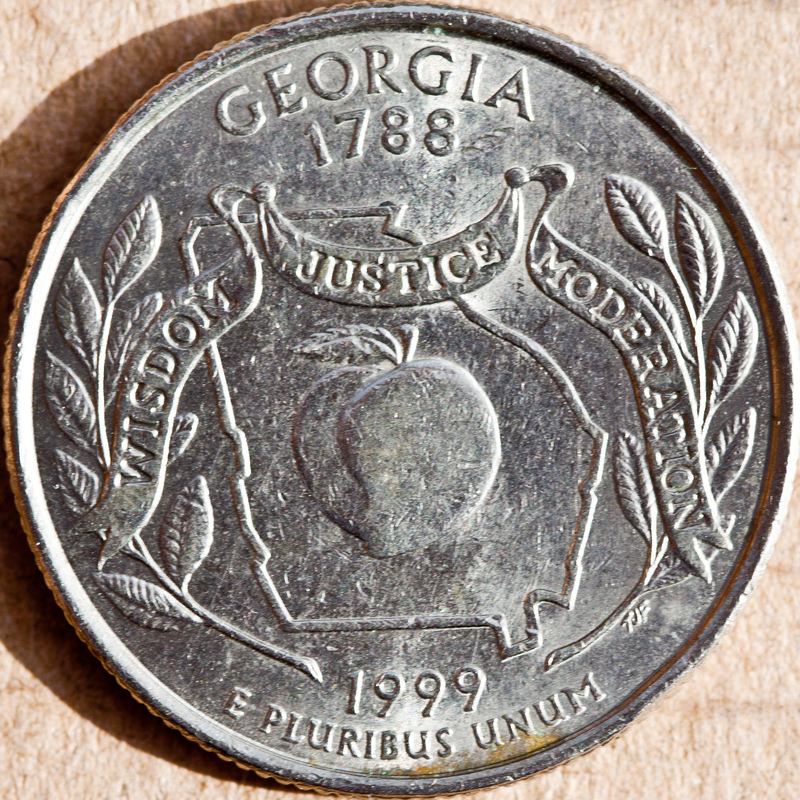 There are several minor (and more common) errors and varieties of the Georgia state quarter. If you want a really rare and valuable Georgia quarter error, then you’ll want to land an off-metal quarter error struck on an experimental planchet (coin blank). All of the 1999 state quarters (Delaware, Pennsylvania, Connecticut, Georgia, and New Jersey) have been found struck on so-called experimental planchets that were intended for the Sacagawea golden dollar. Think you may have one of these rare off-metal error quarters? Show it to a reputable coin dealer or get it certified by a third-party coin grading company. Georgia quarters struck on experimental planchets have sold for as much as $10,000! Some coin collectors have identified minor doubled dies on certain Georgia quarters, with some doubling in the peach or in a few of the letters. These are so far all very minor errors that generally require magnification to see — making them less desirable than major errors such as the 1955 doubled die penny, which has significant doubling that can be seen with the naked eye. Some error coin enthusiasts may be willing to buy these doubled die Georgia quarter errors for $3 to $10 apiece. Die chips and die cuds occur when pieces of the die break away from the die, which strikes designs on blank coins. A die cud is a specific type of die chip that is attached to the rim. A die chip is a little raised blobs elsewhere on the face of the coin. Coins with die chips and die cuds are valued based on the size and location of the error — with higher values for pieces with larger chips or a chip in a more prominent location. A 1999 Georgia quarter with a die chip or cud can be worth anywhere from $2 or $3 to more than $50! Similar to die chips, die breaks and die cracks tend to form on aging dies and get larger as the die suffers more and more wear. However, unlike die chips (which normally take the form of blobs or dots), a die break appears like a straight or jagged line across some of the coin. Die breaks often form between design elements, lettering, or sometimes connect from the rim to another part of the coin — perhaps even the opposite rim! Like other coin errors, the value of a 1999 Georgia quarter with a die break depends on the size and location of the die break. That said, the rarity of and demand for certain die breaks also play a role in determining their value. If a certain scarce die break becomes popular with collectors, then its value will increase dramatically. Georgia quarters with die breaks are worth $3 to $5 and up. The value of an off-center Georgia quarter varies, depending on the magnitude of the error. For example, a 1999 Georgia quarter that is missing only a sliver of its rim is rather common and doesn’t really have any additional value. But if you find a Georgia quarter that is missing parts of the lettering by the rim (or even more of the design), you’re talking serious dough for a rare error coin like that… perhaps as much as $100 or more for a Georgia quarter that is missing 25% to 50% of the design! What’s The Value Of A 1999 Georgia Quarter Without Errors? If you’ve found a Georgia quarter in your pocket change and you don’t notice any errors on it, then you’re probably wondering if it’s worth more than face value. Unfortunately, worn copper-nickel clad Georgia quarters without errors or other oddities are worth only 25 cents. This is true whether you’ve got a 1999-P Georgia quarter struck at the Philadelphia Mint or a 1999-D Georgia quarter from the Denver Mint. However, uncirculated 1999-P and 1999-D Georgia quarters (those never used as money) are worth 50 cents and up. A copper-nickel 1999-S Georgia quarter is worth $1.50 to $3. A 90% silver 1999-S Georgia quarter has a value of $4 or more. Additionally, really well preserved 1999 Georgia quarters with seemingly perfect surfaces (no nicks, scratches, dings, etc.) are worth much more. Some of these supreme uncirculated and proof Georgia quarters are worth $20 or more! How Many 1999 Georgia Quarters Were Made? Georgia quarters are common — very common. Nearly 1 billion were made! As you can see, Georgia quarters aren’t really rare coins. But if you find one with an error… that’s a different story! Want to know more about these cool 50 State Quarters honoring “The Peach State”? John Flanagan designed the portrait of George Washington as seen on the obverse (heads side) of the quarter in 1932. William Cousins modified the design in 1999 to accommodate the new features of the 50 State Quarters. T. James Ferrell created the design on the reverse (tails side) of the Georgia quarter. Georgia was the fourth state to join the Union, ratifying the U.S. Constitution on January 2, 1788. The Georgia state song, “Georgia On My Mind,” was written in 1930 Hoagy Carmichael and Stuart Gorrell. Georgia native Ray Charles helped popularized the song with his 1960 album “Genius Hits the Road.” The hit was adopted as the Georgia state song in 1979.